I-5 Gallery is pleased to announce it’s first Holiday Marketplace Show. The gallery will be transformed into a marketplace filled to the brim with unique hand made gifts for everyone on your list. Wouldn’t you prefer buying from a local artist this season? Experience guilt free shopping when you support the artists while leaving with one-of-a-kind gifts for your loved ones. The Holiday Marketplace will be open Saturday, December 12th and Sunday, December 13th ONLY from Noon to 5PM. Participating artists are from the Los Angeles area and Brewery Art Colony Residents and either make gifts, crafts, small art objects, handmade jewelry, handmade clothing or provide artisan services. Please join us for the opening on Friday, December 11th from 7-10PM to get a head start. Have a glass of wine; bring your list and shop for the holidays in a stress free environment. Chat with the actual artist(s) and have a story to tell along with your gift purchase. Not your average holiday shopping experience. Happy Holidays to you from the I-5 Gallery! I-5 Gallery is pleased to announce it’s first Holiday Marketplace Show. The gallery will be transformed into a marketplace filled to the brim with unique hand made gifts for everyone on your list. Wouldn’t you prefer buying from a local artist this season? Experience guilt free shopping when you support the artists while leaving with one-of-a-kind gifts for your loved ones. I-5 Gallery is pleased to announce the first Holiday Marketplace Show. We invite artists who create gifts to contact I-5 Gallery ASAP to book space for this show. Space is open to all artists who make gifts, crafts, small art objects, handmade jewelry, handmade clothing, provide artisan services (i.e. an architecture, design or furniture firm wanting to promote their business) as well as Brewery Arts Complex residents. It will be a unique mix of artists and Brewery Arts Complex residents selling their holiday inspired creations. Payment: Cash, check or credit card at time of booking, no exceptions. Call and book soon as space is limited, truly. The Brewery Artwalk Association is pleased to announce the ‘Fall Brewery Artwalk Sneak Preview’ show of new work by artists that reside and/or have studios at The Brewery Arts Colony. As a precursor to the upcoming Artwalk the weekend of October 24-25, 2009, over 40 artists are exhibiting their work at I-5 Gallery. 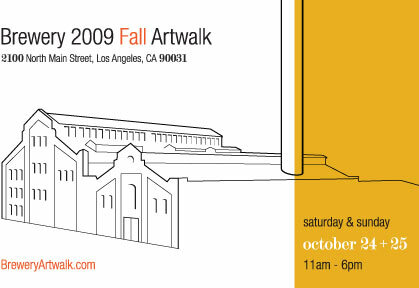 In most cases, the exhibiting artists have studios that will be open during the Artwalk. In a few rare instances, artists that have studios (which will be closed during the Artwalk) have chosen to be exhibited in this show. This is a great opportunity to visit The Brewery Arts Colony, get familiar with the I-5 Gallery and perhaps enjoy a bite at Barbara’s At The Brewery Restaurant before or after the show. Then you will be prepared for the upcoming Fall Artwalk, October 24-25 and in the know about the artist studios you wish to visit first. See you on Friday, October 2 at 7PM. Curator Marla Koosed explains: “MFA Conversations Part II builds on the foundation established by Part I’s show and artist conversations and will offer another opportunity for dialogue among the artists and their works. It will also offer visitors to the gallery an exceptional opportunity to see an edited sample of some of the finest work being produced by Southern California MFA Graduates. While most MFA shows are up for a limited period of time; Part II will be up for 2 months. This allows time for the scheduled artist talks, for the participants to discuss their work, each others’ work, and to share those conversations with a wider audience, the public.” Artist talks are scheduled from 2PM to 4PM on Saturday, July 25th and Saturday, August 22nd. On the heels of Part I, MFA Conversations Part II will show work from 7 schools; Art Center College of Design, UC Los Angeles, UC Santa Barbara, UC San Diego, UC Riverside, Otis and Calarts. This show is not a survey or comprehensive of all the graduates: Instead, studio visits for all eligible candidates for this show were conducted, and participants were chosen from that pool. The intimate space of the I-5 Gallery allows for an exhibit like this to function and for the works to interact by the space they cohabit.